A blog about paper-making and paper crafts. Some people are so bad at cooking they burn water. 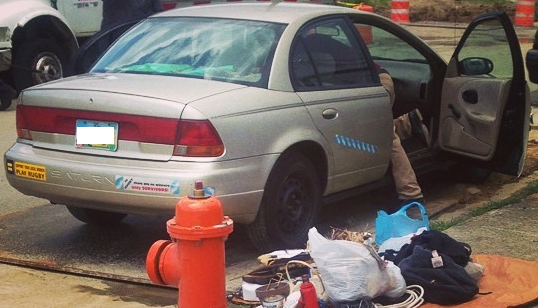 Some people are so bad at driving, they get a ticket for recklessly operation of a tricycle. Some people are so bad at drawing that you mistake their self portrait as a landscape of an oily puddle on asphalt. I'm so bad at social media that I posted less than a dozen entries on this blog in a year and a half, then completely forgot it existed for 4 years. My personal computer has fried its hard drive no less than 3 times in the past 4 years, so some length of absence from this blog was inevitable. I now have a (currently) functioning (if cranky) laptop. Given those true and important facts, I think it's time to resurrect this blog. Today is Small Business Saturday. It's the response to Black Friday, the day after Thanksgiving when some camp out in front of or get up early to go to major retailers to take advantage of the offered door prizes, huge discounts, and special products. Small Business Saturday evolved in order to turn that intense shopping focus onto a group that often gets overlooked because they aren't a household name. Small businesses vary widely. Some businesses are so small they only have one joint owner/employee. Some have one or two designers that outsource work to larger companies and have the items sent back to them to finish and ship to customers. Some have many employees and large inventories, and gross hundreds of thousands of dollars in sales every year, but by legal definitions are still considered "small." Regardless of the type or size of the small business, the motivation behind Small Business Saturday is the same: shop small. The Big Name retailers that we all know are ubiquitous across the country, or across a region. Chances are if you ask, "Where can I get a flat screen TV today?" you'll get the same answer from many people. That's kind of the drawback. It's the same thing from place to place. The next person who asks will likely get the same store suggestion and the same TV. If you want unique, you need to find a unique place to shop. Small businesses are nothing if not unique. Every story behind a small business is different. Among the handmade market, there are often similarities from shop to shop. Someone somewhere saw a gap in the market. Someone saw the need for a product that was similar to what everyone else was selling, but they wanted it a little bit different. So they made one for themselves to fulfill the need that the mass market wasn't providing, and gosh it was so much fun, they made another. Or maybe their friend at their day job saw it an asked where they bought it. Oh you made it? How much would you charge to make me one? Then another and another, and the person thought, maybe there are a lot of other people who would like these. Thus is born a new small business. 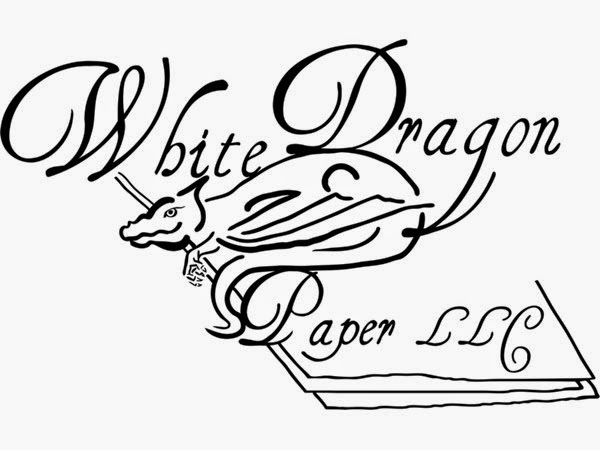 White Dragon Paper did not have such creative origins. This small business was born entirely out of boredom followed by desperation. One summer between semesters in college, I somehow stumbled upon an online tutorial about how to make handmade paper. I needed a blender, a picture frame, some window screen, fabric, a plastic tub, and some paper to recycle. I went to the thrift store and got started for less than $20. Soon all the sheets of handmade paper were stacked on my shelf and I had no room to put more. I heard about Etsy through the YouTube based series Threadbanger that showcases a ton of great DIY projects, often from people who sold their creations on Etsy. I signed up and listed some the paper I had made. Turns out, people REALLY like handmade, recycled paper. I don't blame them. It's gorgeous, environmentally friendly (because it uses paper that would normally go to the landfill or to commercial recycling centers), and the texture isn't something you can achieve by mass-producing papers, even high quality decorative ones. Six years later my business has grown so much larger than I ever imagined. I'm still in touch with my roots, making paper by recycling discarded copy paper and cardboard, but I've expended into making journals from scrap leather and handmade paper, or upcycling thrift store books into new, blank journals (with handmade paper pages of course), and upcycled paper beads, paper sculpture, ink, and envelopes. My small business is by no means a way for me to get rich financially. I'm still working several part time jobs that have nothing to do with the degree that I'm paying hundreds of dollars each month to pay back. I still have to save money in case of freak accidents like when my dog jumped the fence and somehow managed to cross 6 lanes of traffic unscathed, but broke a leg when he heard me calling for him (because I hadn't seen him cross the street) and got clipped by a car. Or when my one and only vehicle decided to throw a piston through the engine wall, totaling the whole thing. My small business helps pay my bills. It fills the gap my other part time jobs leave while allowing me to do work that is meaningful for me rather than something that just passes the time while whittling away at my soul. I won't wake up on a milestone birthday wondering what I've been doing with my life all these years. I'll wake up and realize how much good I've done and how thoughtfully I've spent my time. I'll wake up and realize what this small business has allowed me to give back to the world. I've given back landfill space. I've given back fresh air that won't be polluted by processing the papers in a large recycling facility. I've given back a week of my time (so far) volunteering at Camp Sunshine teaching kids to make paper. I've given back the money I've donated so far to help sponsor more activities and help bring kids to the camp. So on Small Business Saturday, consider where you are spending your money, and what impact it is having. Consider forgoing the mall shopping and instead finding out more about businesses that are unique to your area, or about any of the thousands of small businesses on Etsy that will use your hard earned dollars to help further their business's mission, whether that is simply buying more supplies to keep the business going, or to help the business's owner to pay household bills, or to generate money to donate to a cause. There are so many small businesses that you're sure to find something that lines up with your values and goals and also has a wonderfully unique product for you to give someone this holiday season that surely won't be exchanged because someone else at the office gave the recipient the same thing you did. Find a gift that will not only be as unique and memorable as the person you are giving it to, but that will also have a meaningful impact on the person you are buying it from. Shop small this Saturday, this holiday season, and all year round. Once every few years a papermaking class is offered at the local community college. It just so happened that it was offered this year and it just so happened to have been advertised outside my art history room. So I signed up. Incidentally, the instructor was the wife of a coworker, but that was just a point of mild amusement. The class itself was a huge eye-opener and I had more than one life-altering experience. The class covered topics from the history of papermaking, basic papermaking, making paper from plant fibers, dying paper, marbling paper, book binding, and sizing paper. Before this class I had never made paper from plant fibers. After this class I bought 5 pounds of soda ash (it only takes about 3 teaspoons to cook a batch of plant fibers) because I knew I would be making piles of plant papers. One of the neatest things was using these corn stalks that I had been saving since the previous fall. We had a HUGE windstorm when hurricane Ike blew through the midwest. I was over at a friend's place out in farm country when the storm hit and there were cornstalks blowing all over the yard. I was rather reckless (for once) and ran outside while tree branches were falling and the wind was bending flag poles, grabbed an armfull, stashed them in the car and ran back inside. Oh the risks I'll run just to make paper....Six months later a friend made corn on the cob with our burgers when I went over for dinner and I asked her to save the husks and silk for me. We didn't know each other well at the time, so she just gave me a very strange look, but set them aside in a bag. In class I made some excellent, strong, rough paper with them. The best part was the look on my friend's face when I handed her a birthday card made from our dinner a few weeks before! She said "Did you make this from MY corn husks?" Yup. I did. The corn was probably the hardest fiber to work with. It was very hard and the paper turned out much like cardboard as far as strength and stiffness go. A much softer, though frustrating fiber was the gampi (shown at left). It is a Japanese fiber used to make very thin, strong, flexible, translucent paper. It was great for sandwiching rose petals. The thinness of the gampi allowed the rose petals to show their color off. I still have some of that fiber in my freezer though. I don't have the proper mould and deckle to use with it at the moment. When I get a good one made (which I plan to do by this fall, but more on that later) I will use up the rest of the gampi fiber. I had a blast taking that course, and would happily take it again the next time it is offered. After finishing the course I decided that I had been looking at my career options totally wrong. I had been so frustrated that I couldn't focus on a career. Nothing pulled me. Nothing was so obvious that I said, "Yes, that's what I need to do!" It was hiding in my basement all along though. I have been making paper almost every day for years and I haven't gotten tired of it. The variety of papers to make keeps me from getting bored. I can use the paper and feel like my work has a purpose. If I get tired of pulling sheets one day, I can bind them into a book instead. The book covers can be as artistic and creative as I want, or very plain and simple if I don't feel up to creating a masterpiece. It's the perfect job, because it never felt like work. Etsy Papermakers Guild Paper Swap. The wonderful ElenaMary who founded the Etsy Paper Makers Guild recently organized a paper swap among its members. We sent her sheets of our own handmade paper (one for each person participating) and recieved back one sheet from each member. I loved the paper so much, seeing all of the different styles and characters in each sheet, that I thought I would share them with you here! Many of these sellers I have run across on Etsy already and have admired their work. Now I can actually feel and touch their work and admire it all the more! Participating members (besides myself) were ElenaMary, Pupla, Oakmother, EvesOriginals, ParellelBotany, BBesigns, CSPaperandBeads, PaintingPam, Lot10Paper, ThePaperButton, Nightcloud, HollySpinner, and RagQueen. I loved seeing the different materials people used and the different interpretations of handmade paper. In my work I typically use handmade paper as a support for art, as in to be drawn, written, or painted upon, but some of the guild members treat the paper itself as a work of art, so much so that I feel I should hang it on my wall in a frame! Some of the papers were very smooth, some even glossy and slick, but others were very rough with plant fibers and shiny inclusions like stars and metallic confetti! I'm not sure what I will do with all this paper yet, though the idea of building a journal around each sheet is very appealing. For the moment, I think I will just continually leaf through the sheets and admire them all over and over again. I highly encourage you to check out each of these seller's shops! 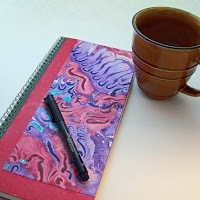 I've read about marbling paper in a book I bought recently called Paper Transformed which details many ways to alter paper using chemicals, paints, and other materials to get various effects. I personally have not tried, it, but I admire the work other artists do using this process. One thing I enjoy about where I work is looking at the old books in our library's storage area. Many of the covers are wrapped in marbled paper, and they are too old to have been made commercially. The designs are absolutely amazing. Paper marbling is a process which involves floating various pigmented substances, oftentimes ink or paint, on the surface of water in a tub. Designs are drawn into the colors and a piece of paper is laid overtop of it. The paper picks up the color and once it dries it has a pattern that resembles marble stone. For today's Featured Seller, I will be showing you some work by Etsy artist Amanda of PersistentGreen who makes and uses her own marbled papers (shown in photo above). Amanda uses a modern method of marbling which involves liquid starch, powdered alum and acrylic paint to create her wild and bright marbled papers. After discovering this more approachable and affordable alternative to traditional marbling techniques, she was addicted! Amanda uses her own marbled papers for journal covers, as seen at right. I love how the limited use of colors can produce such varied effects and designs. They are simple in color, but complicated in design and make perfect journal covers or endpapers. 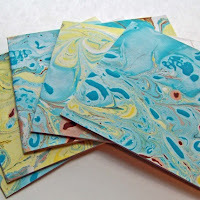 She also makes unique cards from the marbled paper in color combinations as varied as the uses for paper--from yellow and blue and green to chocolate brown and cherry red. 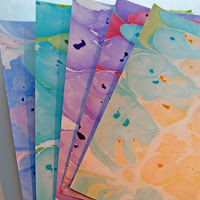 If you want to try paper marbling at home, here's how! There are many different methods and materials available for marbling paper. 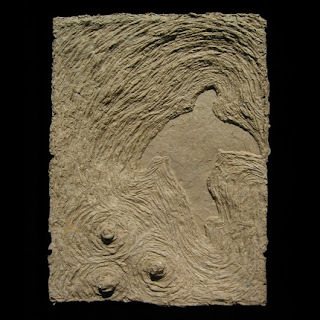 There are several variations in Paper Transformed. The one I will detail here is a basic water marbling technique. First, spray the paper with the mordant solution and allow it to air dry completely. Then fill the dish with water until it is just covering the bottom. Prepare the paints, making sure they are very dense. You don't want them watered down. Then drop the paints into the water and lightly swirl them. Don't do this too much or the paints will mix into the water and the design will be lost. If you are using pastels, just scrape the pastels with a knife or scissors into the water. For powdered tempera, just sprinkle the powder into the water. Immediately press the sheet of paper into the bottom of the dish until it is wet, then lift it out starting from one end and moving to the other. Lay the paper paint-side-up on a towel to let it dry completely. After it is dried, you can flatten it out using an iron on low heat. 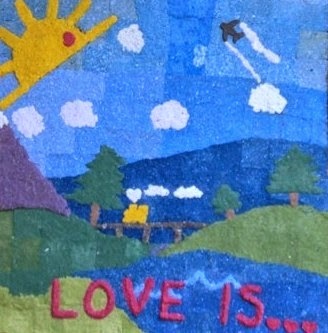 I was perusing Etsy looking for handmade paper items to share with you. Then I came across BigBlank's etsy shop. Far beyond the molded paper bowl, vase, or nondescript "snowball," BigBalnk has created unique works of art using a paper-casting technique. 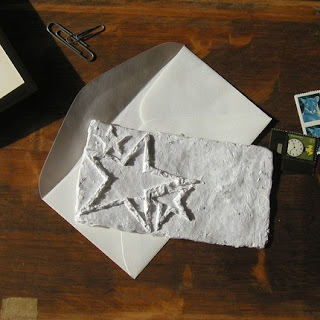 By pouring paper pulp into clay or wax molds, BigBlank creates wonderful gifts and unique alternatives to the usual card, such as this "Three Star Cast Paper Card." One of the things I like best about Bigblanks process is that it is centered around reusing materials. Instead of tossing scraps of junk mail and office paper or chunks of styrofoam, BigBlank reuses it to make sculptures. Sealbird , which recycles brown paper bags into a beautiful work of art to hang on the wall. Again, BigBlank repurposes items that otherwise would have been thrown away, and gives them new life and a new reason for existing. You can visit BigBlank's shop at http://www.bigblank.etsy.com/ and I highly recommend that you do so! I love how the coptic stitching looks like braiding. I wasn't sure about the color of the thread I used, but once it was finished I couldn't imagine it with any other color. Making the journal was a blast too. First I made all of the sheets of paper, which took quite a while. There are 55 sheets total, which when folded in half makes 110 pages, 220 front and back. Then I trimmed them to size and as I made the sheets over a period of days, I also made the covers. I reclaimed some scrap chipboard and cardboard and aged and distressed a sheet of paper. Then once I covered the cardboard with the paper, I drew on the islands and such and added the edging and inside cover paper. The inside cover paper is a gold metallic tissue paper, which proved a problem once when the first layer I put on got a hole torn in it as I smoothed it down because the glue had made it too wet. Oh well. The second go-round worked out better. Altogether I am very happy with this journal and look forward to making more. While browsing etsy I came across thelongread's top 100 free tutorials of 2008. Looking through them, I found two involving creative uses of paper, so I thougth I would pass them along and give a few nods toward these blogs. Paper mache bowls are nothing new, in fact the art of paper mache has been around since the Chinese were making helmets out of it as far back as 202 B.C. However, Painted Fish Studio shows us an alternative to the dull text-riddled use of grey newsprint with a tutorial for paper mache bowls. Simple, easy, looks great with a handmade decorating scheme or to use as a place to throw your keys at night so you don't walk around the next morning, late for work, wondering if the dog/cat/baby ran off with them. Just Like Martha shows us a creative way to use up old magazines. It's a bit past Christmas at the moment (and no help if you're non-Christian unless you have a secret ambission to make a paper forest display for your home), but still, when the holidays roll around again, I'll be sure to make at least one of these magazine Christmas trees. In other news, I have finished my third coptic-stitched journal and intend to photograph them tonight and upload the pictures to my computer along with the shots of my dog playing in the banks of snow taller than her. I'll share the journal-making goodness and snow-puppy adorableness later tonight. I promise, she's cute, even if you're not a dog person. She looks more like an Ewok from Star Wars.